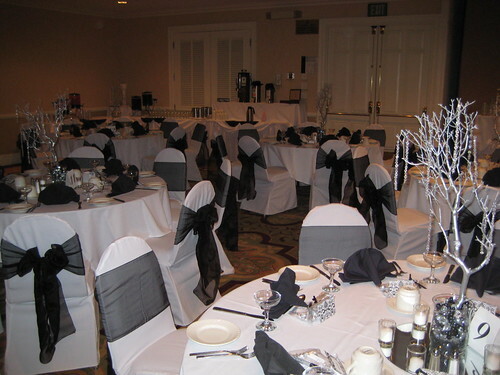 Black and white wedding themes are a sophisticated choice. However, this doesn’t mean that you can’t have some fun with this type of themed wedding. While it seems like a straight forward theme idea, there are still some creative options that you can consider for your big day. As with any theme you can kick things off with wedding invitations. Below are 6 more ideas to get things started. Your attire for your wedding day can be as simple as a white wedding dress and a black tux, or you can change things up a little. Black wedding dresses have become very popular, and there is a growing number of styles to choose from. To really stand out, your groom can wear a white jacket or full white suit to accompany your black dress. If a white tux isn’t the style you are looking for, stick with the traditional black tux that will compliment whatever type of dress you choose. Finish off your wedding attire with a white pearl necklace and matching earrings. If you were lucky enough to get a black diamond engagement ring or earrings on your wedding day, those will also fit in perfectly. If you are getting married in a church, tie black bows on church pews along with white flowers like calla lily, tulips or roses. For outside ceremonies you can decorate with daisies, pansies and calla lilies among other types of white wedding flowers. For your bouquets, consider using black jack roses (deep red) mixed with white accent flowers. They can also be used with your ceremony decorations and centrepieces at your reception. If you ever wanted to throw a black tie event here is your chance. If you do choose to do this, make sure you indicate on your wedding invitations that the event is black tie so your guests know and dress appropriately. White tablecloths with black napkins work well for reception tables. You can also use black runners on white tablecloths as well, or use long black skirts underneath white tablecloths for a nice effect. Instead of cake, consider going with chocolate and vanilla cupcakes with ying-yang black and white icing. If you are going with a cake, have you baker or cake designer use white flowers or black and white fondant on your cake. No wedding is complete without a signature drink these days. Options for black and white wedding themes include black and white Russians, chocolate martinis and black sambuca-based drinks. Something totally unique that will definitely get your guests attention is black vodka. Check out Blavod who is the leader in the black vodka industry. They also have some great drink ideas like the ice berg and midnight sun. Send your guests home with the ever popular black and white cookie as a wedding favour. There are also some great options for black and white favour boxes to put candy in. Dark chocolate is always a crowd favourite, and it just happens to fit into your theme. Package it up in white favour bags tied off with black and white ribbon. If you are thinking that sticking with just black and white wedding themes is a little too plain for you, consider adding just a tiny splash of colour to your day. You can do this by choosing an accent colour like red, pink or blue. Your accent colour of choice can be used on your dress, in decorations, the flowers you choose and your cake. Don’t overdo it though as you want to keep your theme intact. This entry was posted in Themes by Ms. Wedding Cake. Bookmark the permalink.